As light emitting diodes become the standard lighting, it is important to understand the dissimilarities between watts and lumens, as well as how to establish the right amount of lumens for achieving optimum atmosphere in a space. 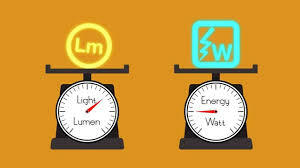 Let’s get to understand what lumens are: The lumen is an international scientific measurement standard for the quantity of light generated by a specific light source or its measured brightness. On the other hand, Watts measure the required amount of energy necessary for operating a light source. The only challenge here is that there isn’t a mathematical formula to convert watts to lumens, like in converting kilograms (Kgs) to miles. The advent of LED technology (which is more energy efficient) has changed the lighting landscape. It has rendered the use of conventional bulbs meaningless. Unfortunately, this rapid change in technology has made the old-fashioned “Watt” light measurement less able to accurately indicate the bulb brightness. This does not allow for the different efficiency in conventional types of lights (i.e. filament bulbs, halogen & fluorescent) and LEDs. This is why light output should be measured in Lumens and not watts. Thus, the energy industry is now opting to use a more stable as well as widely-accurate unit to measure light intensity commonly known as Lumens. 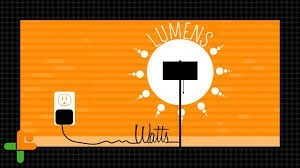 Lumens (abbreviated as lm) is a measure of light emitted by a lamp/ bulb (but it must be visible with the naked eye). The greater the Lumens number, the brighter the light. On the other hand, watts don’t measure the brightness, rather the amount of electricity used. 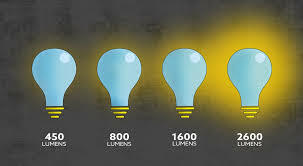 The effectiveness of bulbs is expressed in terms of the lumen-to-watt ratio. This is the number of lumens produced for each and every watt consumed. 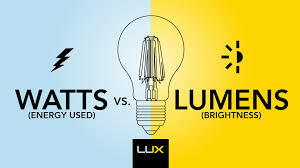 The rate of conversion of watts to lumens by bulbs varies and is dependent on the technology used. Lighting bulbs producing more L/P (i.e. 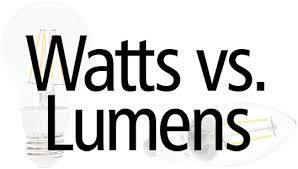 lumens-per-watt) are cheaper to run since they generate more light and use less power. LEDs possess the highest L/W ratio—what this means is that they are capable of generating a higher amount of light (from the bulb in question) for relatively little energy. The introduction of LEDs tremendously reduced power parameter requirement for buyers. This is because you’ll be getting a bulb fixture that’ll cost you 90% less as far as your electricity bills are concerned. What’s more, these bulbs are likely to last longer. Producing less heat as compared to incandescent bulbs helps LEDs to realize a 50,000 hr. lifespan. So, when shopping around for a replacement lighting bulb, think of lighting fixture that’s brighter, longer-lasting, as well as more energy-efficient—the LEDs. The two measurements can be confusing and are similar. However, they have subtle differences. Lumens are used to measure the amount of light emitted (i.e. the total visible amount of lights from a given source). This is also known as its luminous flux. On the other hand, candelas are used to measure the luminous intensity. It is also important to note that candelas are more predominant in America, while the EU prefer lumens. LEDs are gaining popularity across the globe because of their unprecedented features. When it comes to a commercial application, nothing can beat the performance of advanced LED panels. 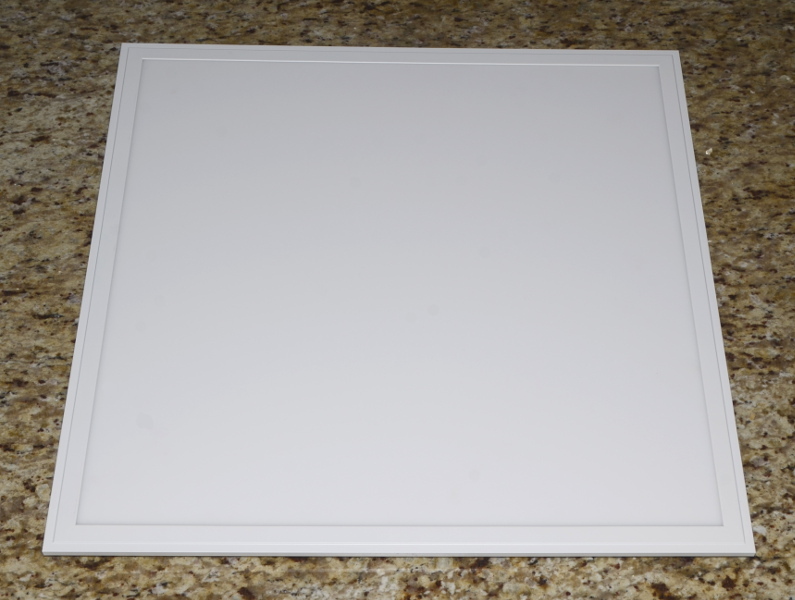 Modern LED panels are designed to offer high quality lighting than any other forms of illumination available. As a result, more and more commercial property owners are using LED panels to illuminate their premises. A wide variety of LED panels are available on the market today. You must choose them according to your lighting needs as well as premises. If you have smaller office, you can go for 600x600mm LED Ceiling Light Panels because they are ideal for offices having smaller space and fit directly in to the ceiling grid. The panels are actually made to be 595x595mm so they fit. However, choose 1200x600mm LED Panels, if you have larger premises to illuminate. Note- both these LED panels have their own advantages. Explore all the specifications and technical details before placing an order. For commercial premises you will normally need an emergency light which will provide at least 1 lux of light for a minimum of 3 hours. Alternatively, if you have your office in an area, which is prone to frequent power failure or fluctuation, then choose LED light panels that are designed to provide consistent, and flicker free light for hours even after power cut. 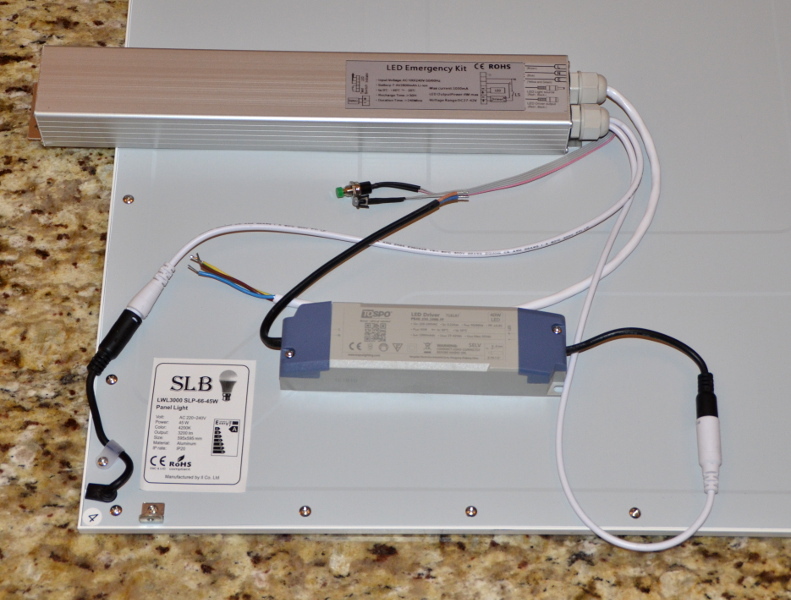 All you need to do is to buy an emergency battery pack with the LED panel. It will provide uninterrupted light and improve the overall productivity of your business. You might be aware that the range of colour temperature varies from 2700K to 6500K. In other words, it gives you the liberty to choose the colour temperature according to your working environment. 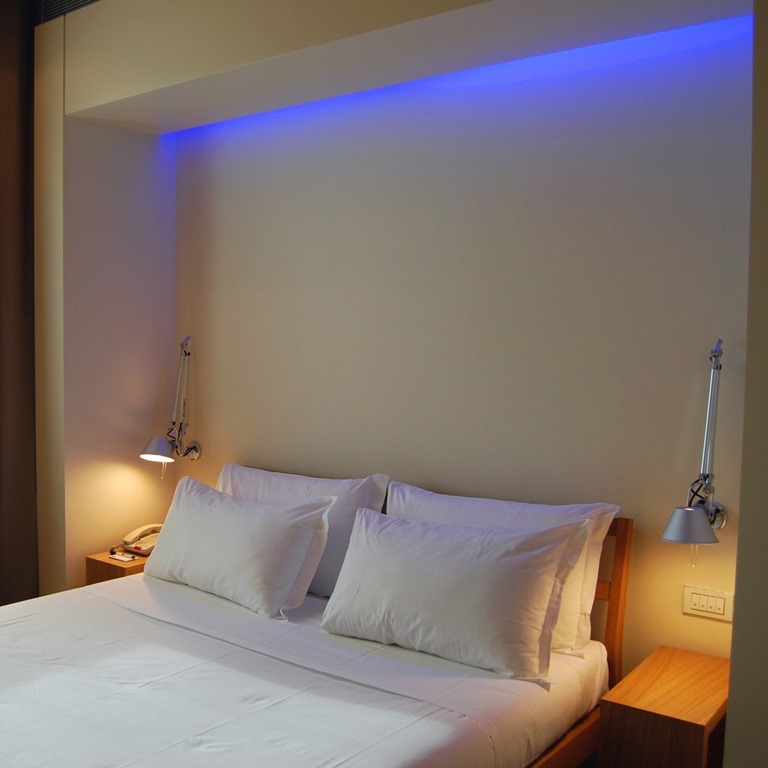 If you have a restaurant or a hotel, choose soft white light because it creates a warm, welcoming and gentle ambiance. In fact, it is also ideal for living and dining rooms. On the other hand, cool white light is perfect for normal offices that require sufficient lighting to perform daily tasks. However, if the nature of work is somewhat precision oriented, you must choose daylight. 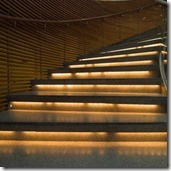 If you are remodelling your premises then you have the option to choose thin LED panels. For better result, choose 600x600mm LED panels because they are ultra thin – just 10mm thick, which makes them ideal for commercial applications. So, consider the above points before buying LED panels. However, it must be noted that it is advisable to order LED panels of different colour temperature and after checking their functionality and output, order them in bulk quantity. • Quick and economical installation. • Provide sophisticated and professional look. • Durable, beautiful and eye-soothing. • Deliver high quality bright light. • Functional, non-toxic and eco-friendly. • Ideal for modern homes as well as offices. • Flexible, suitable and maintenance free. • Ensure efficient light output. • Produce warm and pleasing light. • Available in multiple designs and styles. • Perfect for large office space. 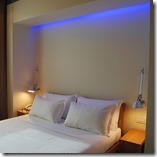 • LED panels are compatible and can easily fitted to ceilings. If your are looking to create the perfect atmosphere for your home, you must choose dimmable LED lights. These lights are specially designed to provide warm and bright light. Today, a wide variety of dimmable LED lights are available on the market. But what about the dimmer modules? 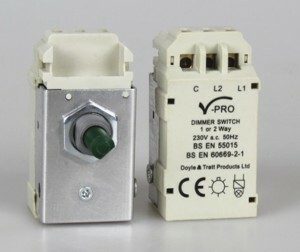 Thanks to Varilight, now we have got a wide range of advanced V-PRO Dimmers. 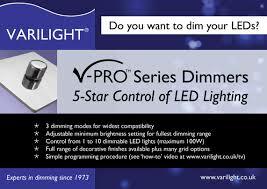 These Varilight V-PRO Dimmers are designed to offer the best possible dimming performance. With the help of Varilight’s V-PRO Dimmers, you can easily control dimmable LEDs, dimmable CFLs, electronic low voltage transformers, and much more to make the environment pleasing, cosy and classy. 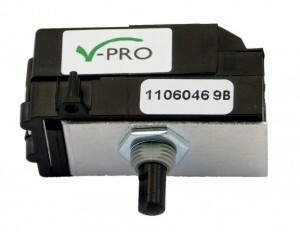 The Vpro can be purchased in a number of different styles of faceplate to match with the Varilight Product Range. 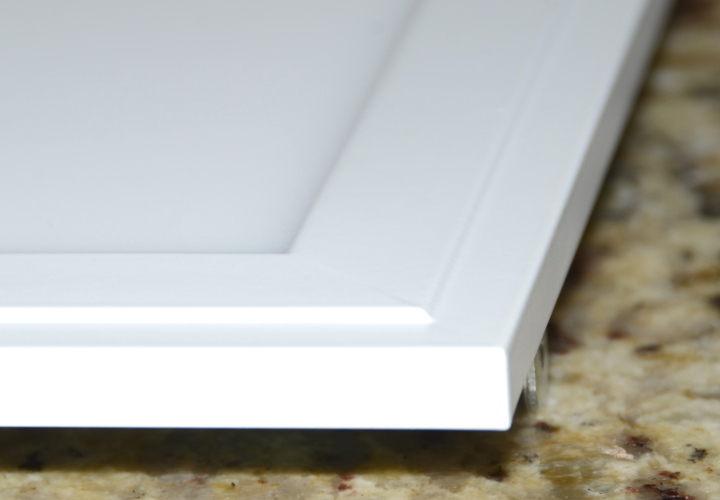 By example there are plain white, the Classic range or the screwless low profile Dimension range. Then within these ranges there is a choice between brushed steel, polished chrome, premium white, black and a number of other finishes which can be selected to match your interior. Alternatively you can just tale the dimmer modules and fit these into existing dimmer faceplates. This is particularly useful if you are retrofitting an LED dimmer into an old fashioned dimmer which needs upgrading to work with LEDs. One of the most significant features of Varilight’s Z0JP250-P 1G Vpro Dimmer Module is that it provides stable light output. Additionally you can select the mode of your dimmer to match the lights you are dimming. This means you would normally select trailing edge dimming for LEDs and leading edge dimming for other lights. • Flexible, smart and compatible. 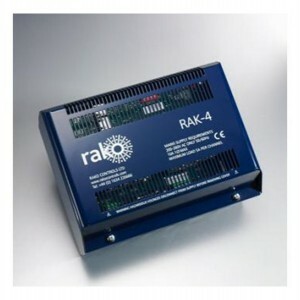 • Provides better dimming control. • Ideal for optimum dimming. • Can be switched between trailing edge and leading edge dimming mode. • The minimum dim level can be set which is particularly useful for LEDs which flicker at low loads. For installations where the 120w maximum LED load is not sufficient, Varilight have now brought out the MJP300 high powered dimmer module. This has all the benefits of the standard version but will take a load up to 300 watts. This is especially useful for dimming arrays of ceiling lights or even LED panels. 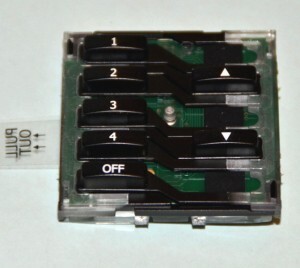 In a number of instances there is the need to have switched light in a multi-gang dimmer plate. The way to accommodate this is to use the Varilight Z0H0 . 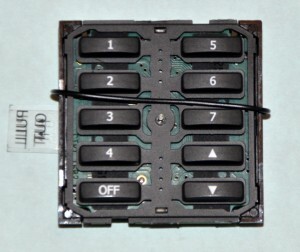 This has the same visual style as the rotary dimmers but operates as a switch by pushing on and off. 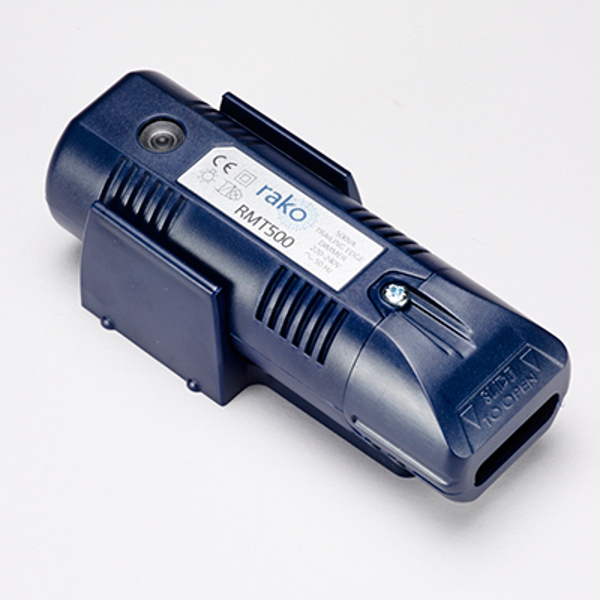 This is excellent for non-dimmable LEDs or fluorescent lights which are normally non dimmable. As it is suitable for a wide variety of halogen and LEDs, you can use them at your home or office according to your requirements. No doubt, you can use dimmable modules to achieve the best possible dimming performance. People choose different types of dimmable modules from other manufacturers as well; however, they always do not get the expected output, but when it comes to Varilight Z0JP250-P 1G Vpro Dimmer Module, the thing is somewhat different because it has the capacity to provide you with optimum output and ultimate comfort. 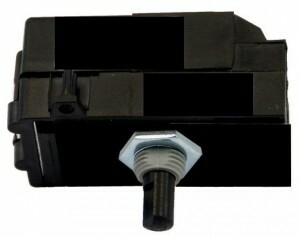 On top of that people choose these dimmers because they can be easily adjusted according to their lighting requirements . So, get ready to experiment with Varilight’s V-PRO Dimmers. Varilight Ranges: Transform Your Living Room Beyond Your Wildest Dreams! 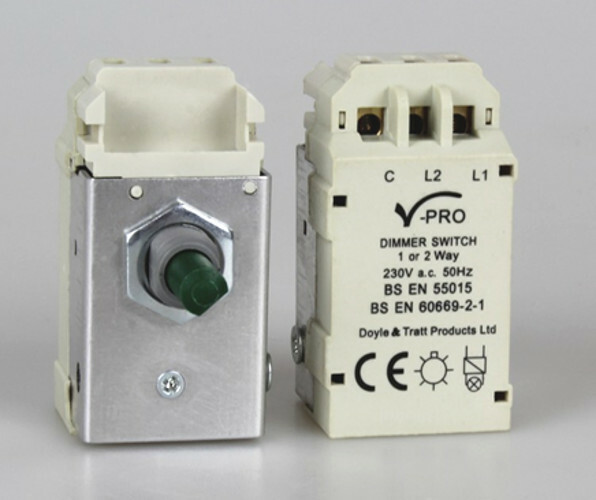 Varilight, the brand name of Doyle and Tratt Products Ltd., was established in 1973 with the main aim of manufacturing dimmer switches as well as decorative electrical accessories. Since then, the company has established itself as an industry leader in the manufacture of various electrical devices, thanks to its many years of experience in this field. 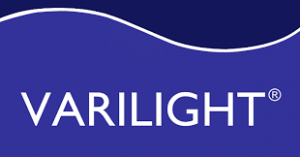 In fact, Varilight products have managed to penetrate the market and gain an international reputation when it comes to quality, style as well as value. No wonder, Varilight was voted to be the winner of the Queen’s Award for Enterprise of 2006 (which was under the continuous innovation category). Due to its vibrant and continual innovation in the field of electrical systems, Varilight was awarded The Queen’s Award for Enterprise in 2006. Varilight understands that innovative technical solutions are the only way they can give their products the edge. They have put in place a patented overload protection system (a cost-effective solution) that can benefit even an entry-level dimmer. Moreover, the Varilight microprocessor intelligent dimmers are manufactured to allow for rotary, touch, as well as control dimming. The Varilight range has been made with diversity in mind. Also, they have been accessorized with security dimmers that can accurately simulate occupancy in case you aren’t around. 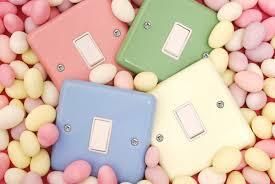 Additionally, they include nursery dimmers. So, you only have to gently set them to glow during bedtime in your kid’s room. Varilight relies on the latest technological breakthrough in manufacturing the world’s best dimmable compact fluorescent lamp (CFL). To achieve exceptional energy-saving devices, Varilight combines CFL and dimmer. The Varilight range has been made with diversity in mind. Also, they have been accessorized with security dimmers that can accurately simulate occupancy in case you aren’t around. Additionally, they include nursery dimmers. So, you only have to gently set them to glow during bedtime in your kid’s room. Varilight relies on the latest technological breakthrough in manufacturing the world’s best dimmable compact fluorescent lamp (CFL). To achieve exceptional energy-saving devices, Varilight combines CFL and dimmer. 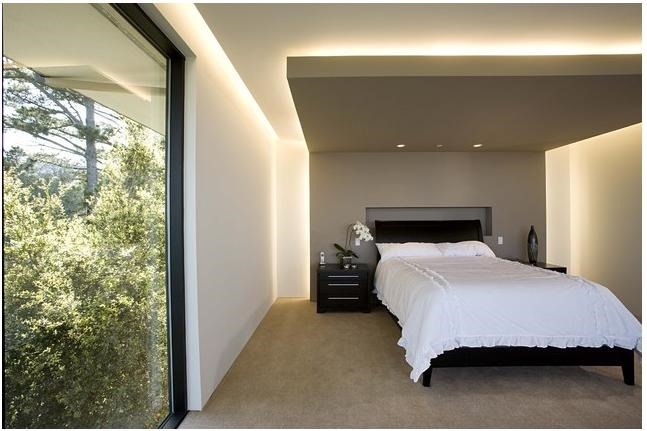 Varilight uses superior technology that features executive dimming circuitry and design features.It also uses cost-effective white plastic and comes in an array of styles such as remote controlled and touch-sensitive dimming accessories. This range encompasses extremely intelligent dimming devices of the white finish. Featuring super-slim faceplates, Varilight products (which are super slim) offers a sleek classy look that can redefine conventional as well as modern interiors alike. Varilight understands the importance of attention to detail.As such; they have endeavored to pair metal faceplates with flawlessly coordinated metal switch rockers, well-designed toggles as well as control knobs. The Varilight dimension screwless is ideal for those who want an ultimate style but low profile metal accessories. 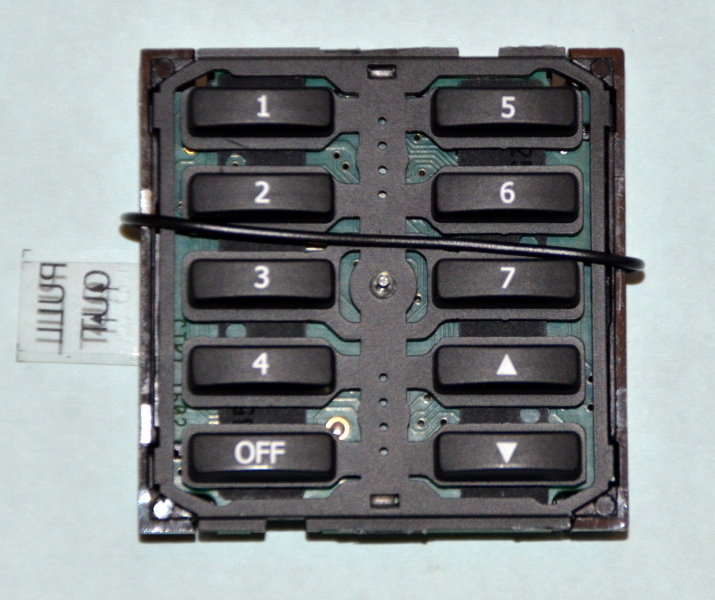 These products are coordinated with metal switch rockers, modern toggles as well as control knobs. To create a flawless finish, clip-on faceplates which hide the fixing screws for a simpler decoration has been incorporated. 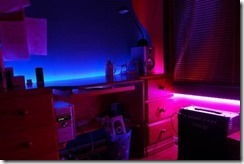 Where can I use LED strips? In a previous article we discussed in depth where LED strips can be used in the kitchen, to give ideas and show what it would look like. We are now going to steer away from the kitchen and go into detail of where else LED strips can be used. The range of uses and places where you can put the strips is so wide; this article however is going to focus on its uses inside the home. 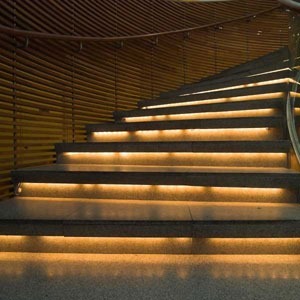 The LED tape has a multi-use of both creating light but also creating an atmosphere. The bedroom may seem like an unlikely place to put the strips but, when used in the right way, they can be very atmospheric. 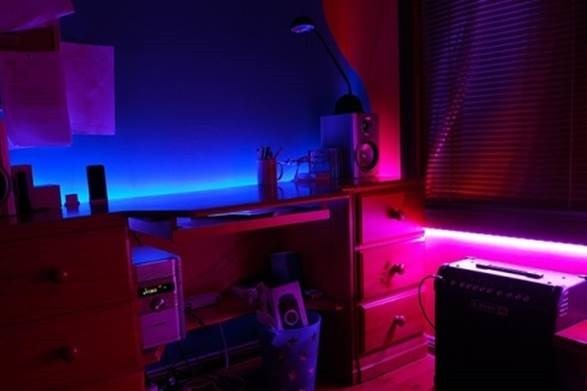 Where would you put LED’s in the bedroom to make them atmospheric? Putting strips in the ceiling cove illuminates the ceiling and reflects back into the room to create natural light. 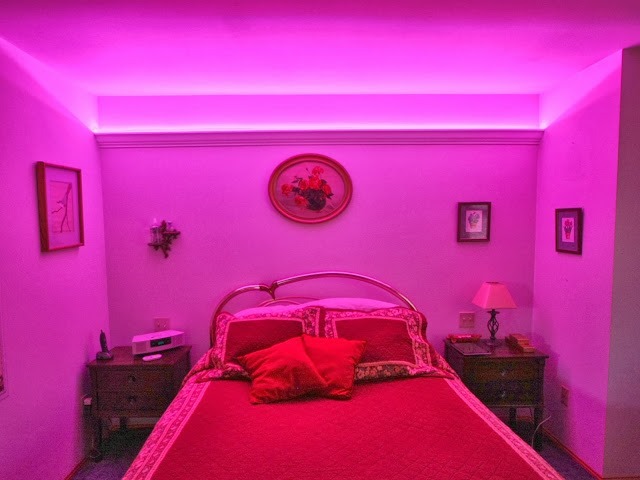 You can also make the bedroom look innovative by using coloured LED’s – lighting up the room to whatever colour the LED strip is – complimenting your colour scheme and adding atmosphere! 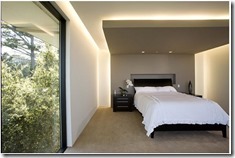 Make your bed even more of a focal point in your bedroom by using LED’s! If you have a head board you can put a strip on the back of that to make it stand out from the wall. 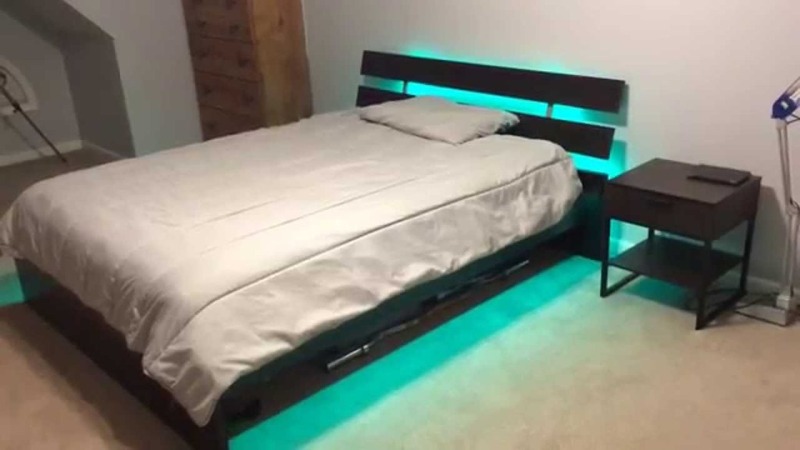 Putting LED strips along the skirting of the bed is also effective and almost makes your bed look like its hovering off the floor! With the added possibility of being able to change the colours of the LED’s they give a playful and fun feel! Got a walk in wardrobe? 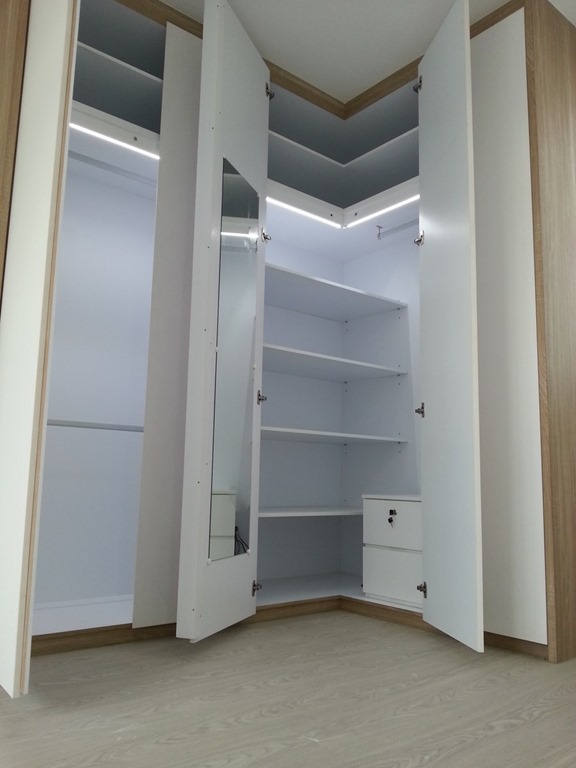 LED’s can be ideal in a wardrobe to light up the clothes and make it look more exciting than your bog standard wardrobe. The tape illuminates the clothes and gives better lighting in the wardrobe where it can sometimes be lacking. 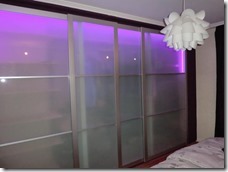 Depending on the style of your wardrobe doors, LED’s can also be used to light the doors and give added effect. 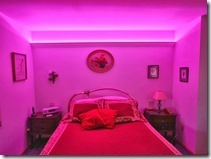 Children’s bedrooms are somewhere the use of LED tape can’t be wrong! Especially with the LED strips that come in different colours, they add variation, fun and I don’t know a child who wouldn’t want some in their room! For additional fun, with the controller the colour of the strips can change – your child wouldn’t want to leave their room! Having LED’s in the bathroom is a lot more common than you probably think. 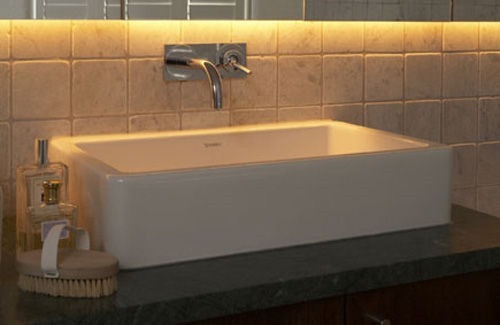 Due to the availability of being able to get the tape in different levels of water resistance, the LED’s are very popular for use in the bathroom because of their versatility. Your shower can be lit up and become a focal point of your bathroom with LED’s. Putting strips at the top and bottom of the skirting of the shower can alter the effect it has. 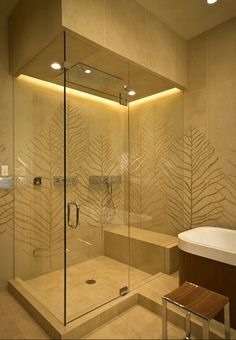 Putting LED’s at the top can act as lighting in itself, so would mean you might not necessarily need anything else to light up the shower. To add a little something extra, you can make use of the colour changing LED’s and change the colour of your shower depending on your mood. A bathroom is the one room you would undoubtedly find a mirror! Mirrors have the ability to reflect; they reflect the room and your reflection as you look into them. 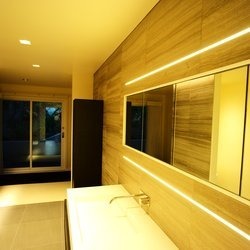 Reflecting the room can make it look bigger, so if you have a small bathroom, why not put LED tape around the mirror to draw attention to it and help aid the impression of the bathroom being bigger. No need to make your bathroom look bigger? 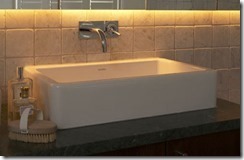 Why not add a contemporary twist and modern feel to the bathroom by adding LED tape around the edges anyway? It creates an illusion of class while also being practical in improving the light, therefore improving the reflection. The practicalities of LED strips in a bathroom have similar uses and fittings to those in the kitchen; for example, you could have a cabinet above the sink which can create shadows below, so why not add an LED strip to the bottom of the cabinet to light the sink underneath? 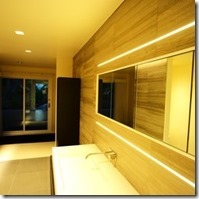 For more ideas of the use of LED’s with cabinets click here. 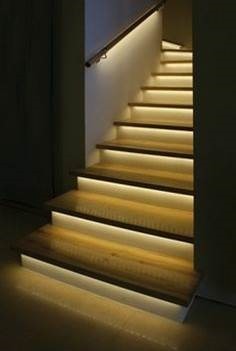 Why would you put LED strips on stairs? Why not! The tape is effective in lighting up the stairs, and would reduce the need for there being any other lighting. 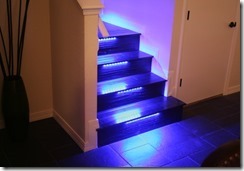 These are a small snippet or some of the places you can put LED’s strips in your home. No matter what style of house you have or what colour scheme there will undoubtedly be a place you can put an LED strip to make the most of the light and effect they give. If you have any further questions or would like any more information please get in contact and we will be happy to help! For our range of LED strips and added extras please click here.